Join SDMBA volunteers as we continue our trail maintenance on upper Noble Canyon Trail. All tools & training will be provided (after signing a waiver). We’ll work to 2 pm; afterward we’ll hand out some swag from Cal Coast Bicycles & drink beers from Lagunitas Brewing Company. All tools & training will be provided (after signing a waiver). No children under the age of eighteen for this workday. Please notify event leader of any medical conditions. Please bring your own food & water, eye protection is required, work gloves, sturdy shoes, sun screen, long sleeves & pants are highly recommended. *This event subject to last minute postponement/cancellation due to winter weather. Check for updates here. Directions: Take Interstate 8 east to the Sunrise Highway (S1) exit; continue north to mile marker 27.3, Penny Pines parking area (upper Noble Canyon Trailhead). A Forest Adventure Pass is not required required at Penny Pines. 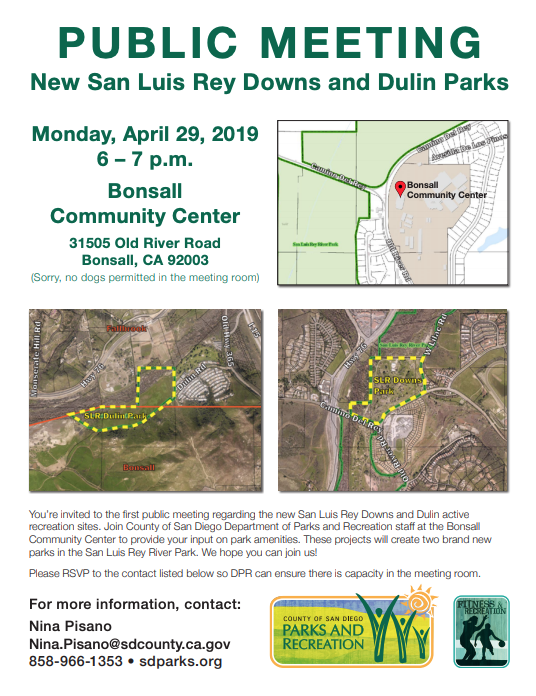 The County of San Diego Parks and Recreation Department invites you to the first public meeting regarding the new San Luis Rey Downs and Dulin active recreation sites. Join County of San Diego Department of Parks and Recreation staff at the Bonsall Community Center to provide your input on park amenities. These projects will create two brand new parks in the San Luis Rey River Park. We hope you can join us! Please RSVP to the contact listed below so DPR can ensure there is capacity in the meeting room. Please RSVP to Nina Pisano at nina.pisano@sdcounty.ca.gov or 858-966-1353. Trail issues and opportunities in and around San Marcos will be discussed. Meetings are generally on the 1st Monday of the month. The Advocacy Committee is focused on opening/creating multi-use trails and bike parks throughout San Diego. SDMBA folks will set up behind the pedal pub to talk trails and projects and how rad your last run at Sky Park was! Join us for San Marcos Trails Day. There will be guided hikes and equestrian ride with this FREE event and an expo area at Lakeview Park.